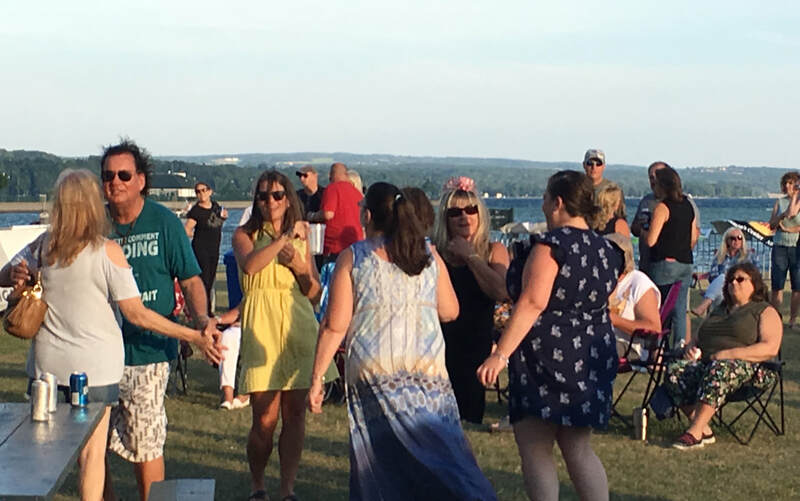 The Auburn Rotary Club is proud to present its 3rd annual Rotary Ribs Rhythm & Blues Festival, July 19-21, on Deauville Island at Emerson Park, Auburn, NY. This festival is held in a beautiful lakefront setting on Owasco Lake, one of the Finger Lakes of Upstate NY. For you competition teams, think of it as a competition in a vacation setting! Once again the 2019 Rotary Ribs Rhythm & Blues Festival will be a New York State Championship and qualifier for the Jack Daniels Championship. The Kansas City Barbeque Society (KCBS) competition is Sunday July 21 with turn-ins beginning at 12 noon. Prize money is $5,000 right now and could grow larger! This festival is the major fundraiser for the Auburn Rotary Club and Auburn Rotary Community Foundation. Our club has been existence since 1915 and its mission is to help youth, veterans and community groups in and around Auburn, NY. For this year, Nick's Ride For Friends, a frontline heroin addiction group and local charity, has been selected to receive this year's festival proceeds so a transportation vehicle may be purchased so people needing help can be transported to rehabilitation facilities. We're proud to help Nick's Ride For Friends! As for the 2019 festival, we've gathered feedback and we're making some changes to this year's festival. ​ Kids 12 and under (accompanied by an adult) are FREE! Advance tickets prices will be $8 per day or $16 for the entire weekend, or $10 at the door or $20 for the entire weekend. More details coming soon on this. Festival Hours will be Friday July 19 - 4 pm to 9 pm; Saturday July 20, noon to 9 pm; and Sunday July 21, noon to 7 pm. Competition team and vendor applications are listed below. For vendors, pricing is based on the entire weekend. For wineries/craft brewers/distilleries and craft/display vendors there's Our Tent/Your Tent pricing options. Here's a couple of options on how to submit your application and payment to be part of this year's festival. 1. Click onto the Buy Now button and put in your name, dollar amount, and either email your completed application to auburnrotaryny@gmail.com, or mail to: Auburn Rotary Club PO Box 446 Auburn, NY 13021. 2. Complete the paper application and mail to us with a check or credit card information. Please note: We will need to match up your application and payment. We can do a form of mobile banking (especially helpful for our Canadian friends). Email auburnrotaryny@gmail.com to get information about this. Come join us in the Finger Lakes. Nothing like a great lakeside competition. Teams will enter into Emerson Park, off of Route 38A. Festival guests can park in Emerson Park or parking lot off traffic circle. Parking is $2 per car, $1 for seniors and those disabled. Parking rates are per day. Congratulations to Good Smoke Barbeque as this year's Grand Champion and the Shortsville Smokers as Reserve Champion. They were 1-2 in last year's inaugural event. A total of 32 teams competed. It was a strong field. Off The Bone Barbeque of Columbus Ohio was the People's Choice Award Winners for festival food vendors. Thank you to The Duke Company for being our presenting sponsor for 2018. Thank you to Lyons National Bank, Jonathan's Furniture and Wright Beverage for being our stage sponsors. Check out our Sponsors & Vendors page to see what groups and organizations made this all possible. And a special thank you to Dave Dixon, as he was awarded the Paul Harris Fellow award, a very high distinction bestowed to a Rotarian or non-Rotarian who exemplifies Service Above Self. Big Awesome BBQ, Pullin My Money Muscle, Millers Backyard BBQ, Smoke This L.I., Good Smoke BBQ, Kiss My BBQ, Let Your Meat Shine Thru, Shortsville Smokers, Smokin Hoggz, Smoke & Fire Craft Meats, Black Hart BBQ, Snortin Boar, Uncle Rick's Briskets, Big Raz BBQ, Jack9 BBQ, Wing-A-Lings, Smokin J's, Neanderthal Q, Three Dogs, BBQ, Shop Boys BBQ, The Stuffed Buffalo, The Smokin Dutchmen, Holy Smokes, Beantown Smokers, Priorville BBQ, Hawkeye BBQ, 5 Alarm BBQ, Big Rich's Backyard BBQ, Smokin Foolz and Team Eatapedia, Team Wally BBQ, Rusty’s Smoke BBQ. These teams are our original entries for the 2018 event. Here are the 2018 team results. Convenient Parking Available at Emerson Park, Island Park area (Off White Bridge Rd) and Deauville Island. Overflow parking available at Auburn Senior High School on Lake Avenue. No shuttle service available. No outside coolers, beverages or food allowed. No glass. No pets allowed at Festival. Bring a valid government issued ID. No exceptions. For Google Maps, use 2 White Bridge Road as your destination point. For up-to-minute updates check out the Rotary Ribs Rhythm & Blues facebook event page.